I’m getting the itch to travel again which is bad considering I just bought a 50 year old home that needs a ton of work. It’s easy to forget how much time (and money) the new house needs when I see other people’s pictures of cities around the world, especially cities that I love. So it was fairly fortuitous that in an email this morning, Bezar (I love them!) 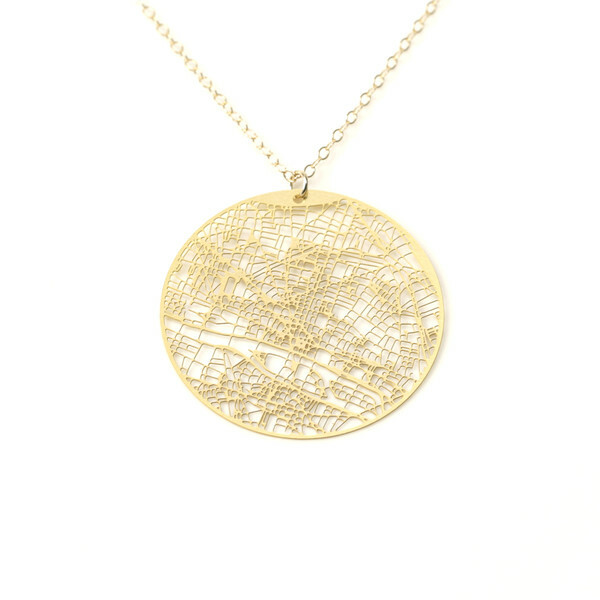 featured this gorgeous grid necklace of Paris, one of my favorite cities. Isn’t it beautiful? They have other cities too and I was ready, credit card in hand, to buy one of Austin (my favoritest city) but alas, they didn’t have it. Despite not having my beloved hometown, they do have a bunch of other amazing cities from around the world. I love how the city is represented so delicately and that if you look closely, you can pick out neighborhoods that you love! 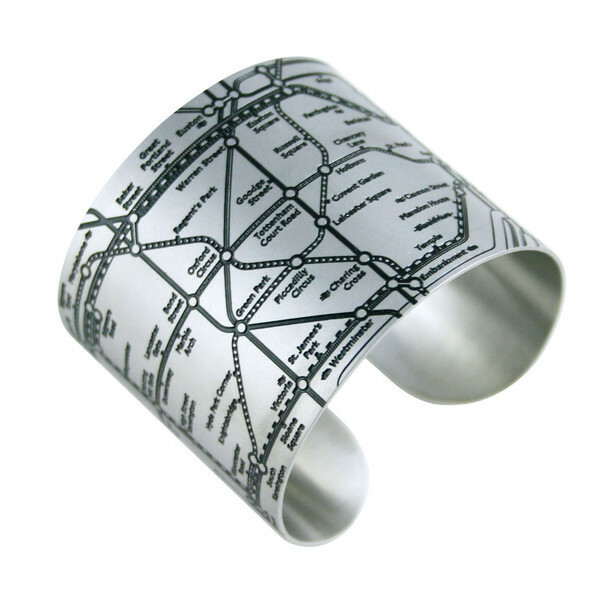 They also have this fun cuff representing the Tube in London which I might be added to my Christmas list. Ah, I miss Europe and traveling. I know that the house makes waiting to book those flights worth it, so it seems like a beautiful reminder will have to suffice for now. Any of you itching to travel back to a favorite city? You guys, I am elbow deep in paint and feeling a little overwhelmed. Turns out that every single inch of the new house needs to be repainted. I’ll talk more about that later on, but for now, let me tell you that my days consist of working and painting and not a whole lot else. In hopes to retain some of my sanity, I spent some time searching the Internet for pillows because pillows are a whole heck of a lot more fun than paint at this moment. 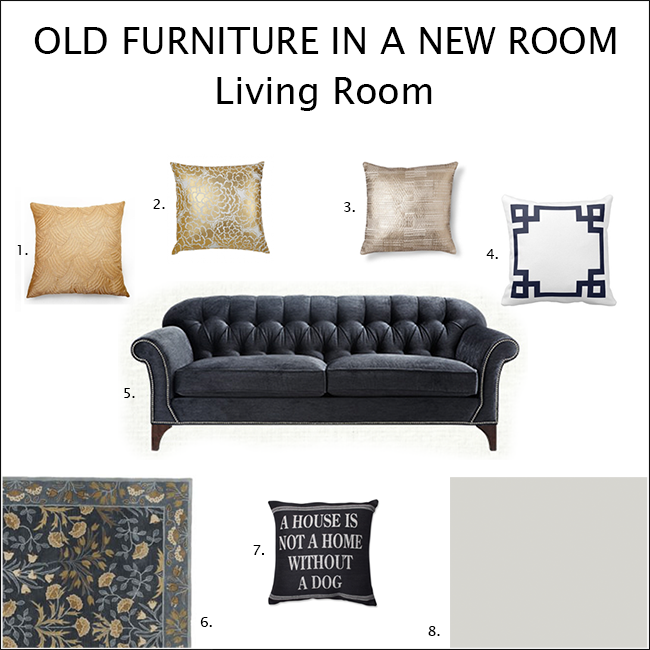 We just bought new sofas and a new rug (so those will be coming with us) so I needed to find some fun, affordable (buying a house is expensive! ), and not matchy-matchy pillows. #8 (in the bottom left corner) is the color I’m currently slathering all over the walls downstairs. It’s a beautiful true neutral gray and I’m excited to show you what it looks like when I’m finished! But let’s get back to the pillows, shall we? I’m thinking each sofa needs some white pillows (we already have some right now) but I’m really looking for a pop of gold and fun as well. I love #2 but I’m not sure that husband will go for the additional floral design. #1 is pretty but but might be a little too yellow so I’m thinking #3 might be our best bet. I thought that the dog pillow might be a fun little one too add since our little pup pretty much runs things around here. So what do you think? Which gold pillow do you like the best? Also, did you see that insane price on the greek key pillow cover- it’s under $5. Insane. Speaking of insanity, it’s time for me to get back to the painting that is taking over my life. Check in tomorrow for updates on the lighting that came with the house. 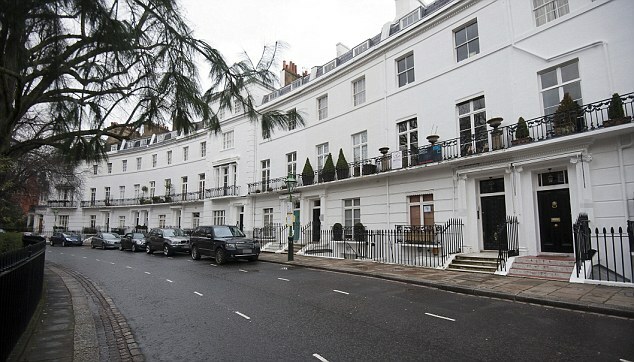 So here she is, the new house! We closed last week and couldn’t be more thrilled! Built at the end of the 60’s she’s a beaut but she absolutely needs some TLC and elbow grease and I’ll be sharing more as time goes on. I’m still compiling an extensive list of all the things that need to be done (think ripping out 50 year old intercom systems, etc) but I thought that I’d give you a glimpse of what we plan on doing with the exterior. 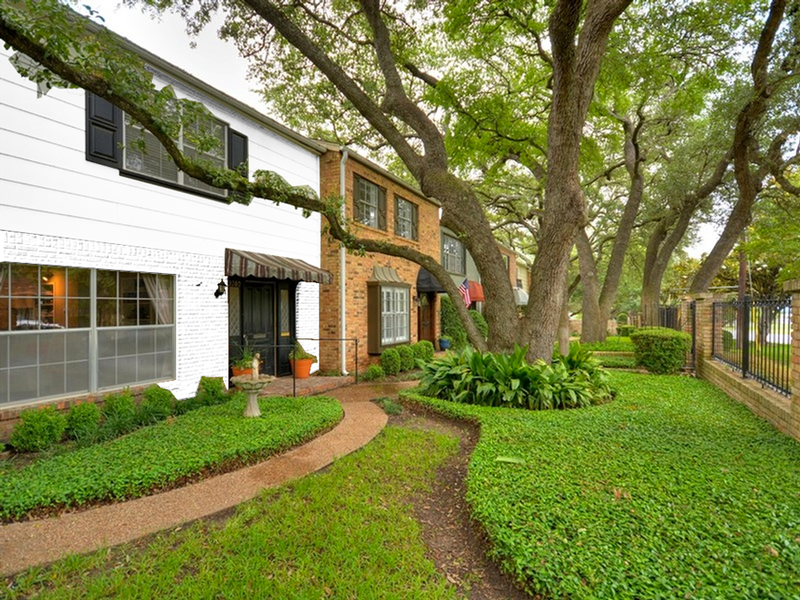 To give you (and our HOA) an idea of what we want to do with the outside, I had the listing image photoshopped to show how much better it’d look painted white. Don’t you think it looks SO much better? I feel like the brick and wood being the same color helps it feel less choppy and more like the 2,000 sq foot home that it is. 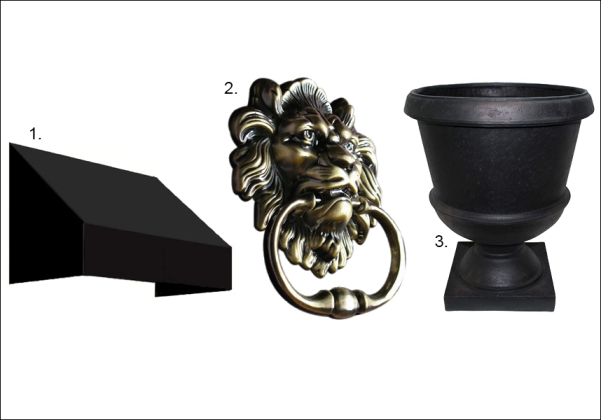 While the white paint is definitely the biggest change to exterior that we hope to make, we also have a few other purchases that will help it feel little more London-y and give it that cool black and white look. So what do you think about our plans? We couldn’t wait any longer and already put up our door knocker (we got ours in London and it’s fab) and hopefully we’ll get the other bits done soon! 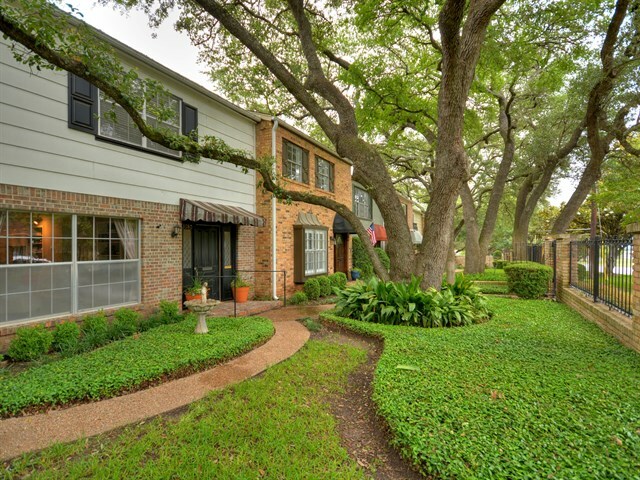 Wish us luck with the HOA! I’m sure you’ve all heard of Humans of New York (HONY), the photographer who takes photos of New Yorkers and tells a little snippet about their respective lives. This year he’s traveling the world again and has landed in Pakistan. You can check out so many beautiful pictures of his on his Instagram or Facebook but you should definitely check out the latest Indiegogo account. He does a great job of describing the issues there but the one that touched my heart the most was his feature on modern-day slavery. 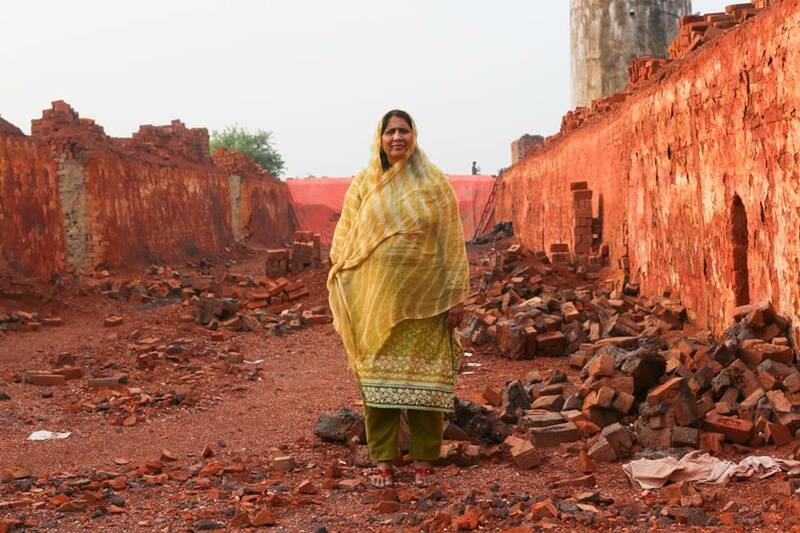 Fatima (pictured above) is a women in Pakistan trying hard to end slavery through education with only very little by way of resources. She’s endured multiple beatings and threats on her life, and she remains unwavering in her quest. Fortunately, HONY photographed her, spoke out for her cause and an Indiegogo account was set up to help her help her people break the cycle. They’ve already reached their goal of $100,000 in less than 1 day but every additional dollar helps. Head over here to the Indiegogo to find out more details on the situation and how you can help. Not one of us can fix the world’s problems by ourselves, but together our efforts can make a difference. I’m sure I’m not the only one who reads a ton of home design and decor blogs, magazines, books and has HGTV on whenever possible. If anyone else out there is paying attention, you’ll notice that some trends that people swore up and down would never come back are actually coming back. The two biggest shockers for me are spongeware or “spatterware” and avocado (as a color- the fruit never really went out :). 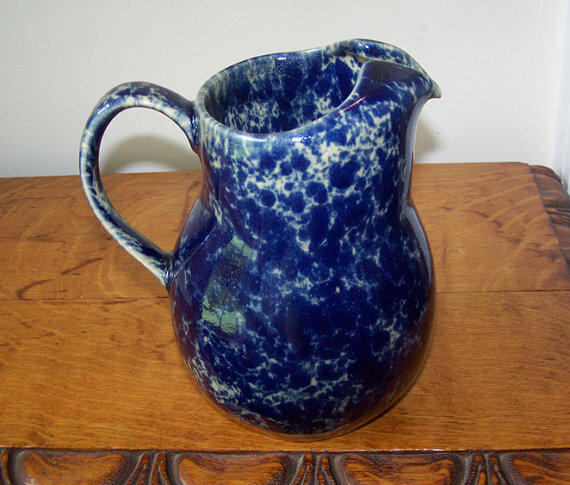 For those of you who try to forget all things 80’s, this pitcher is a prime example of spongeware. This design was actually created as a cheap method of dish design in the early 1800’s and saw a resurgence in interest and manufacturing in the era of shoulder pads and huge hair. Now that about 3 decades have past (where does the time go?) people are staring to fall in love with it again. Tory Burch just created a line of spongeware and even Pottery Barn even has a dish set. You know it’s pretty main stream when ol’ PB has it. My blog hero and amazing designer Elements of Style recently wrote a post on it, entitled “Grandma Chic” but to me it just screams grandma. Am I alone in this? 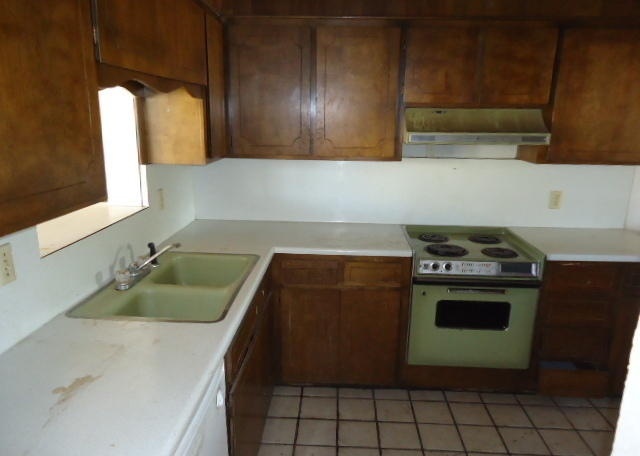 The color Avocado was so popular in the 60’s and 70’s that it pretty much took over. Everyone has seen one of these before, right? 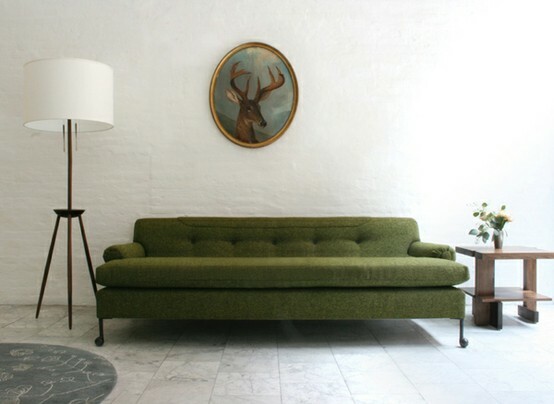 Stunningly simple and modern and the avocado color fits perfectly. I’ll be the first to admit that I was extremely hesitant when I heard that avocado would re-emerge in 2015 and really shine in 2016 but after seeing it so well executed in a few spaces, I’m pretty much sold. So what do you think? Would you entertain with spongeware plates or design your home with avocado? Anyone love or hate either (or both)? And last but not least, the winner of the Kate Spade giveaway is Tiffany Austin! Tiffany- Leave a comment with your email so I can send it your way! I was putting together a flower arrangement the other day and thought I’d share with you my go-to foolproof design. The pictures are pretty self explanatory but I thought I’d write out some tips for each step for those of you who love lists like I do! 1. Collect your supplies and make sure to buy one bouquet “vase filler” and bouquet of the flower of your choice. 2. Cut the vase filler so that it will still be tall enough to hang over the sides quite a bit. 3. Arrange in a star pattern. I didn’t end up having that many individual stems but if you do, once you’re created the star pattern, go ahead and fill in the sides with more filler. 4. Take all the leaves off your flowers and cut them just a bit shorter than your filler. 5. 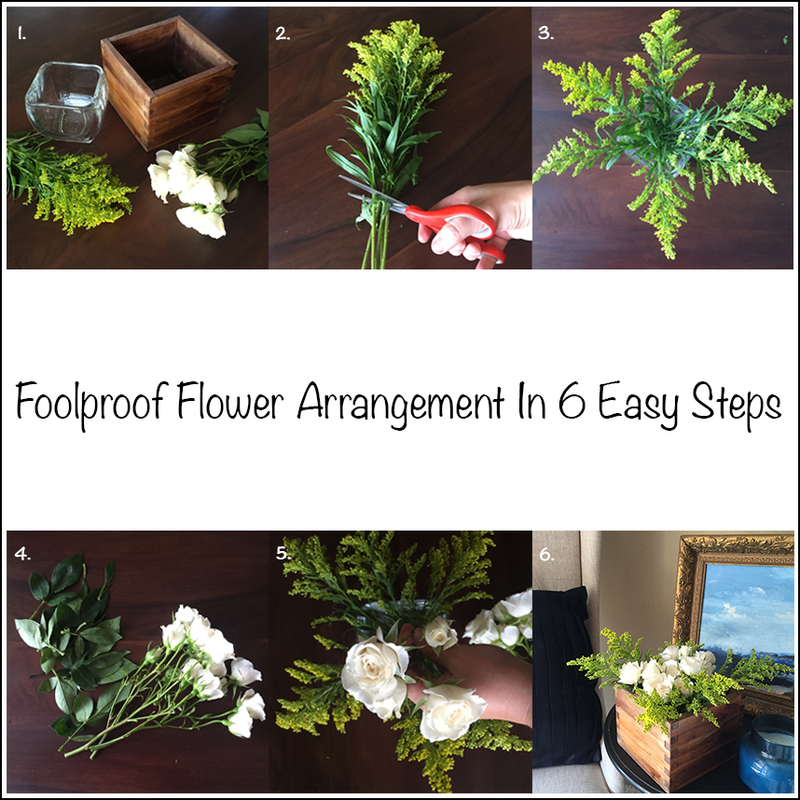 Add your flowers in the middle of the arrangement- this doesn’t need to be overly complicated, just make sure that the center of the arrangement is filled and even. 6. Take your 5-minute arrangement and place it somewhere lovely! I love how easy this arrangement is and it’s crazy versatile. You can create endless combinations with different filler, flowers, and vases. It’s easy and it take almost no thought which makes it perfect for me! Anyone else have a foolproof arrangement that they swear by? I’d love to hear your tips and tricks! P.S. You can still enter the Kate Spade Giveaway here! So yesterday I turned 29 and while I realize that it’s not old, it feels like I’m getting old. But instead of wallowing in the sadness that only accompanies the loss of youth, I decided that I was going to make a list of things to do that would make me feel accomplished or at least a little bit better. Because if you’re going to get older, you might as well get awesomer, right? Exactly. 1. Buy a House: Kinda cheated on this one since we closed on my 29th birthday yesterday but I’m telling myself needed a win to build momentum. 2. See NYC: I’ve been to a ton of major cities, even some in Europe, but I’ve never made it to the Big Apple. I’ve got some flight vouchers I need to use up so I’m planning an autumn vacation with the husband. Central Park in the Fall seems so lovely to me. 3. Paint and Hang a Painting: I’ve always wanted to be an artist but never put much time or money into doing it. This year I will face my fears and paint something to go up in the new house. 4. Re-read 7 Habits of Highly Effective People: This book is amazing and I even worked for Franklin Covey years ago so I’ve totally bought into Covey’s ideologies. I need to be more effective and disciplined so I’m hoping this will help me get back on track. It’s time to be an adult, after all. 5. Ride All the “Big Rides” at Six Flags Again: I grew up going to Six Flags every Summer and some of my fondest childhood memories are being there with my siblings and dad. Even though time is definitely marching on, I want to do things that remind me of the childlike wonder I used to have. Plus Six Flags is just fun. 7. Go to Hamilton Pool: I’ve lived in Austin for over 3 years and have never made it to this other-worldly place. Many film scenes of alien planets and heavens have been shot here because it’s beautiful and unlike any other place in the world. 8. 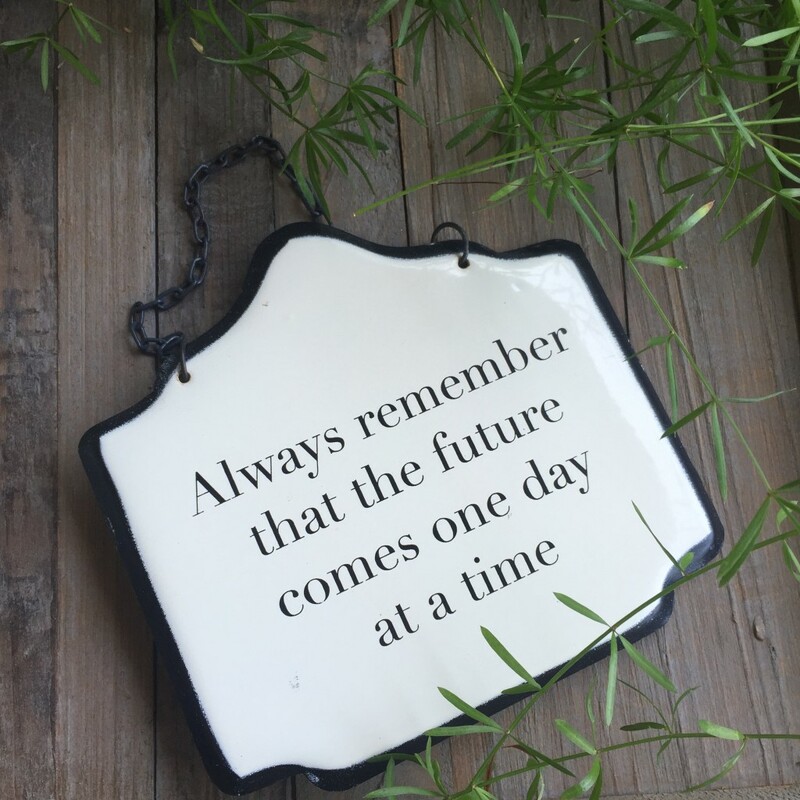 Take Ballroom Dance Lessons: Oh how things change! As a child I would have been mortified if I was forced to take these classes. Now, I cannot wait. We’ve already purchased the lessons, now I just need to conquer my fear of looking dumb and get on the dance floor! 9. See My Abs: Even if this is only for a day, I want to see my abs before I die. It only gets harder (or so I’ve been told) so I’m having that now or never feeling right about now. 10. Adopt an Angel from the Angel Tree: I’ve done this before and it’s one of my favorite things during the holiday season. These goals are only for the next year but I hope to do this each year until I pass. It really is that fun and rewarding. 11. Write a Short Story of My Grandma’s Life: My sweet Gran is one of the most kind and charitable people I’ve ever met. She taught me about love, service, kindness and so much more. During my last visit with her I realized that I only know a fraction of what there is to know about this wonderful woman. I want my future kids and their kids to know how wonderful she is and the only way of doing that is writing it down. 12. Paint My Entire House: Our new house is beautiful. It also needs a paint job. I’ll talk about the more later on but for now, know that this is on my list. 13. Have a Random Acts of Kindness Day: I want to take a day off and fill it with acts of kindness. The world needs more good and I could sure use some more feel-good in my life. 14. Hot Air Ballon Ride: I am deathly afraid of heights but I have always wanted to go on a hot air ballon ride. Husband said he’ll help make it happen so I’m pretty much waiting with baited breath for this one. 15. Make a Delicious and Legit Cake: I’m not a good baker but I’ve always wanted to be able to make a beautiful and delicious cake. I’m friends with some fabulous ladies who have promised to help me out on this one and I’m excited! Side note: I should probably start this after I’ve seen my abs. 17. Do a Head Stand: My balance is horrid, especially since they gave me a new leg bone, so I want to work on that. Hopefully the yoga it takes to achieve this will also help with the abs thing. 18. Be Featured on Another Blog: Blogging isn’t always easy and fun but it’s a great outlet for me. While I’m not treating it like a business, I do think that I should make so goals around it. This one seems like a fairly easy one but we’ll see. 19. Re-do Our Kitchen: Our new place is gorgeous(!) and I promise to show you lots of pictures. While so many things about it are wonderful, it needs an update since it’s pretty much been untouched since 1969! 20. Take the GRE: I want to go back to school and get my PhD in psychology and the first step towards that goal is taking the GRE test. Math is not my friend so I’m completely intimidated but at this point I’ve realized that I can’t let that stop me. 21. Have a Real Photo Shoot: We don’t have children so I haven’t hired a photographer since we were married 6 years ago because I thought no one would care to see photos of a child-less family. I’ve just realized that that’s dumb. We’re taking pictures this year with our adorable dog-child and I don’t care if no one wants to see them. I do. 22. Watch a Meteor Shower: I’m not sure if I know anyone who doesn’t love shooting stars. They just feel magical and lucky. Instead of going to bed like a responsible person, one night I’m going to count as many shooting stars as possible. Besides, who doesn’t need a little bit of extra luck? 23. Take Husband Horseback Riding: He’s never really been and I love horses and rode them quite a bit when I was younger. He doesn’t understand my obsession and I can’t fathom why he isn’t really interested in going. Adding this to my list pretty much forces him to go with me. 24. Re-Take My French Course: In college I was forced to take French to graduate. I hated it. Now after visiting France, I wish I could speak it better so I’m hoping that if I practice it enough that when we go back (hopefully soon) I’ll be more proficient at it and have a more authentic experience. Plus, French is so freaking classy. 25. Re-Read My Favorite Classics: To Kill a Mockingbird, The Great Gatsby, and The Secret Garden are some of my favorite books and I just don’t read them often enough. With all of the husband’s travel this year, I’m hoping I’ll crack open these books at night instead of turning on Netflix. 26. Go to a UT Football Game: I love my Alma Mater and it turns out they’re fairly decent at football. The tickets are expensive but the games are so fun so this season we’re making it to one of the games! Hook’em! 27. Make a New Friend: I love people and I love having friends but sometimes I just don’t make time to meet new people because life happens. This year I want to make a new friend, hopefully someone who’s pretty different from me and will help me see the world from a different perspective. 28. Sing a Duet with My Husband: I love to sing and husband does as well. I’m not sure whether it means singing together in church, at a social function, or even just karaoke but I’ve always wanted to sing a duet with him and this is the year! 29. Foster a Dog: So many little pups are out there without homes and need love. While I’m pretty sure that Oakley is the only dog for me, I want to foster a dog and help it find it’s forever home. 30. Do Something For Someone That They Cannot Do for Themselves: I honestly can think of no greater goal than helping someone who feels like they’re in a situation where nothing can be done. I’ve been down and out and wonderful people have reached out and helped me when there was nothing more I could do. I’m not sure how exactly this one might come about but I believe if you keep your eyes and heart open, ways to give will find you. Ending on the kinda sappy one wasn’t what I planned but sometimes you gotta just go with what feels right. So I have to know, any of you out there set goals each year on your birthday? Or have you done any of the things on my list? If so, I’d love to hear about it! P.S. Don’t forget to enter the Kate Spade giveaway here! 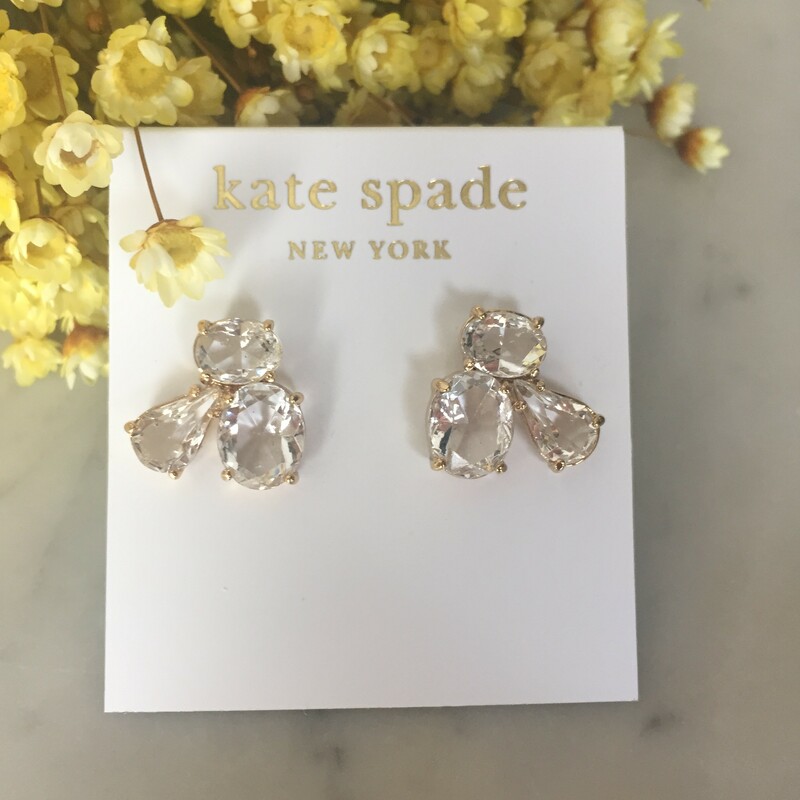 It’s my birthday and today I thought I’d giveaway a pair of Kate Spade earrings to celebrate! I bought a pair of these 14k gold beauties for myself this past weekend and decided that I wanted to give one pair away as well! While I’m off partying the day away (I wish!) make sure to enter by following the steps below. Good luck! 3. Follow me on Facebook HERE and leave a comment letting me know. Winner will chosen randomly using a random number generator and will be announced on the Friday, August 14th blog post. Winner must contact me within 48 hours to claim prize. This contest is not affiliated with Kate Spade, Bloglovin’ or Facebook. Want to see more on Kate Spade? Check out my updated post to see which purse I decided on here. Why You Should Donate to Salvation Army Instead of Goodwill Inc.
We all reach that point when we realize that we have far too much “stuff” that we really don’t need. So we usually grab a bin or a plastic bag and gather up all of our “stuff” and then load it into the car/bus/train to donate. Well, before you head to the nearest Goodwill, think twice. Goodwill does somethings like most charity shops. They take donated items, price them, sell them and use the money to cover costs, fund charity programs, and pay their employees. The problem really lies in the payment of their employees. A loop hole in labor laws allows them to pay their employees less than minimum wage- some just 22 cents an hour! And it’s not like they aren’t making enough to pay these employees, most of which are disabled, they just choose to spend their money else where, especially when it comes to CEO payouts. The international CEO reported a salary of over $725,000 all the way back in 2011. Then they have local, regional, and state CEOs, many of which make well into the 6-figures. Fortunately, there is a bill in the house that would end their ability to take advantage of the loop hole and force them to pay minimum wage to all employees. So with that good news, what can each of us can do in the meantime is donate our “stuff” to other good causes. So why the Salvation Army? They pay their employees fairly, they are run largely by volunteers, they donate grundles of money to women and children, and their National Commander makes less than $200k. So let’s each drive an extra mile or two and donate to a company that does the most good. 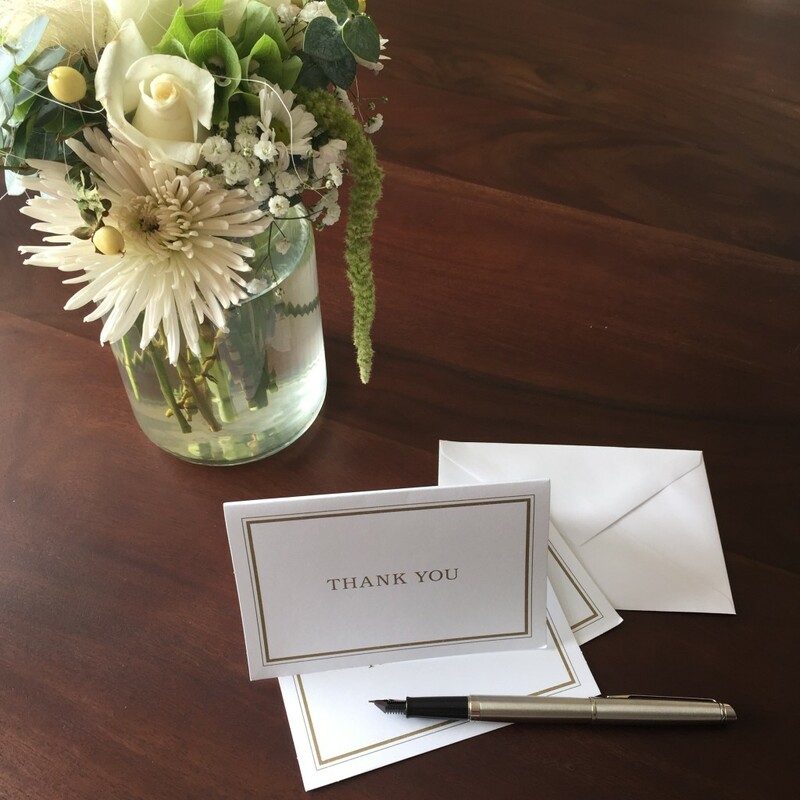 Do You Still Hand Write Thank-You Notes? I wrote a dear friend a thank you note a couple weeks back because she had done something so so sweet and kind for me. When I saw her again, she thanked me for my note and told me that she almost never receives hand written notes these days. At first I was little shocked, but then I remembered last winter when I sent flowers as a thank-you and had to talk the recipient out of profusely thanking me. In both of these instances, these women let me know that very few people send more than an email out now. With the ease of email and the cost of stamps (hello 50 cent postage stamps :() I guess I can understand a little bit but even being a millennial, I can see the advantage of hand written notes. For one, your note will stand out amongst the bills and junk mail, something that’s harder to say about a thank-you email. Second, it’s a chance to show some personal style through your choice of stationary. And lastly, it’s just good manners and people like good manners. Now I won’t say I’ve always been good at sending them-in the past I’ve really struggled with it. But I will say that since I’ve made it a priority (I actually add it on my to-do list) I’ve found that my personal and professional relationships have benefitted greatly. Here and Here are a few of my favorite options to help you in case you tend to run out quickly like I do and Amazon delivers straight to your door! So here’s my question: Do you still send thank-you notes and flowers? If not, why?